CHATTANOOGA, Tenn. (Feb. 7, 2019) – Hospice of Chattanooga staff and volunteers wore red on Friday, Feb. 1, in celebration of National Wear Red Day 2019, part of the American Heart Association’s 15-year-old Go Red for Women heart disease awareness program that kicks off American Heart Month. “One in three women lose their lives to cardiovascular disease, although nearly 80 percent of cardiac events can be prevented, according to the American Heart Association. Hospice of Chattanooga proudly recognizes National Wear Red Day to raise awareness of this threat, especially to women. We also want to acknowledge the compassion and dedication of our staff, volunteers and counsellors in helping terminal cardiac patients find peace and dignity as they face their end-of-life journeys at home,” said Tracy Wood, president and CEO of Hospice of Chattanooga. End-stage patients who suffer from pulmonary disease, diabetes, hypertension or renal disease may also be eligible for the Heart Journey Program, as may those histories of cardiac arrest or unexplained losses of consciousness due to drops in blood pressure. Referrals are accepted by calling Hospice of Chattanooga at (423) 892-1533. The goal of the Heart Journey Program is to admit all eligible patients within three hours of receiving the referral. One in three women lose their lives to cardiovascular disease, although nearly 80 percent of cardiac events can be prevented. 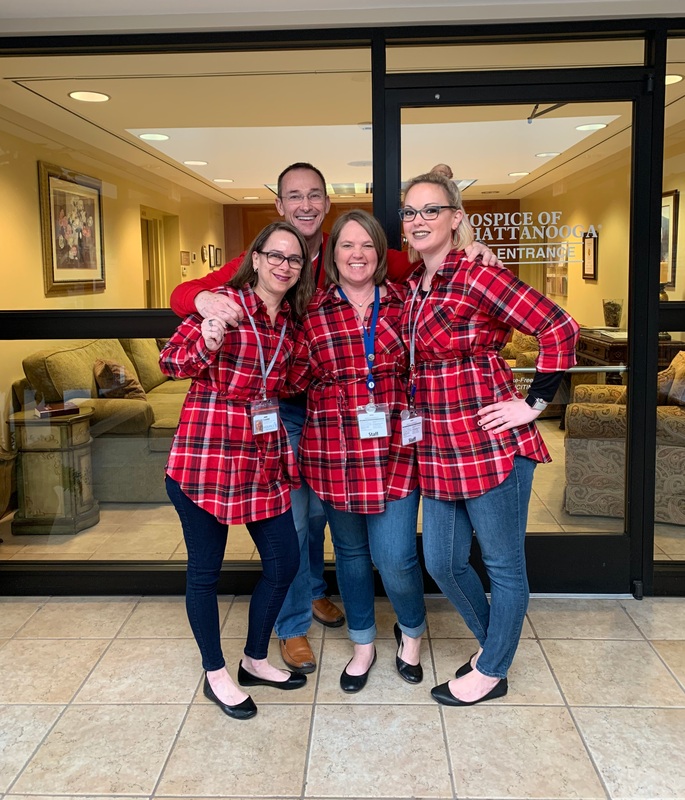 PHOTO CAPTION: Hospice of Chattanooga staff and volunteers wore red on Feb. 1 in celebration of National Wear Red Day 2019, part of the American Heart Association’s 15-year-old Go Red for Women heart disease awareness program.